I’m loving that porcelains and china are the dominant accessories used in this space. I definitely have a penchant for plates hung on the wall as artwork, and the blue and white porcelains are just a wonderfully classic design element! Welcome back to Kristine Robinson’s Interiors. Our next stop on my tour of the lovely mansion, Blairsden, site of the 2014 Mansion in May in Peapack-Gladstone, New Jersey, is called ‘Grey Gardens Great Room’. The designer for this space is the very talented Linda Benson, who said her inspiration for the space was ‘Grey Gardens’, a Hamptons summer retreat owned by a cousin of Jacqueline Bouvier Kennedy. I must say, I was surprised the designer chose to use that name, since my association with ‘Grey Gardens’ is of hoarding and squalor. You see, there was a 1975 documentary made about the mother and daughter who lived at ‘Grey Gardens’, and the story was not entirely flattering. The pair, called Big Edie and Little Edie, ended up living in a falling apart ruin, filled with cats, raccoons and piles of trash. 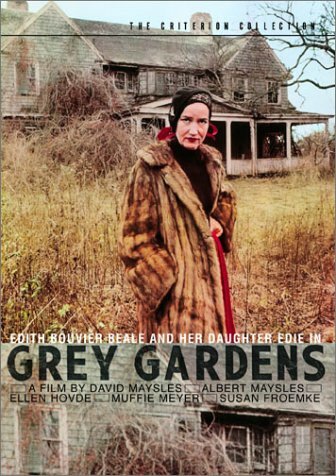 The 1975 film poster from the documentary, ‘Grey Gardens’, shows Little Edie wearing her fur coat and turban while standing in front of her home: ‘Grey Gardens’. I LOVE these documentaries (I own all of the movies on DVD), including the recent HBO movie starring Drew Barrymore as Little Edie and Jessica Lange as Big Edie–it’s terrific! 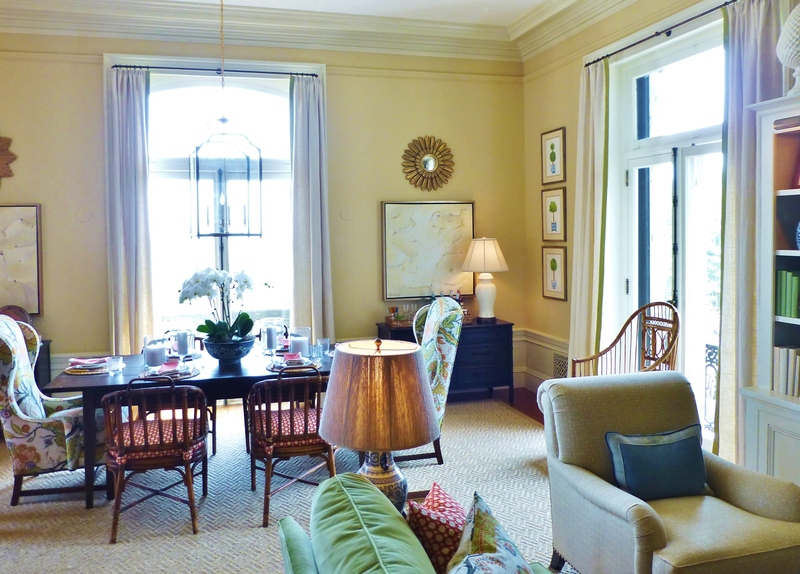 At any rate, this room does NOT represent ‘Grey Gardens’ to me…on the contrary, this is a beautiful, light and airy, yet colorful retreat on the second floor of Blairsden. In fact, I would say it’s one of my absolute favorite spaces in the entire home! Soft neutral walls with ivory trim create a relaxed feel, while colorful fabrics imbue a youthful vibrancy in this 2nd floor great room. The floral pillows, seen here on the green sofa, blue chaise, and blue tufted banquette, are the obvious color inspiration for the space. 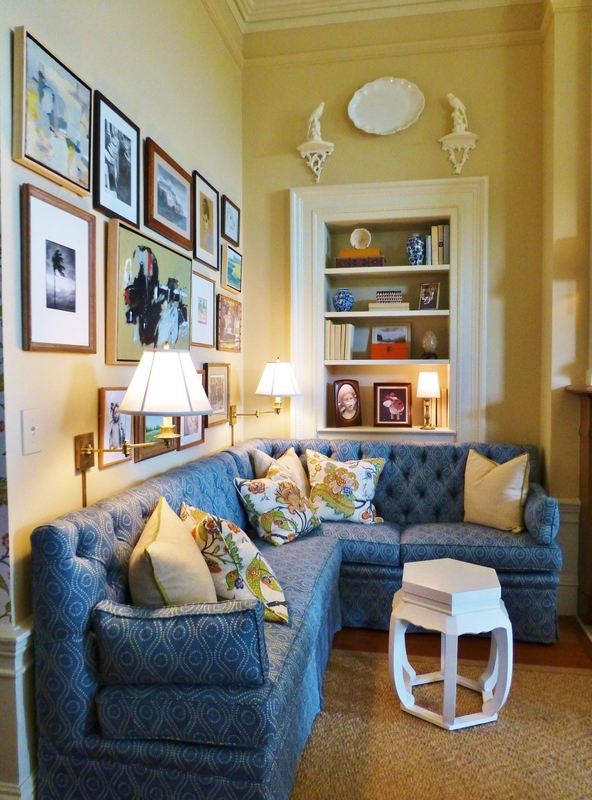 A blue tufted banquette anchors this corner near the entrance. It has a well organized gallery art arrangement with beautifully practical wall-mounted lamps and a well-placed bookcase for keeping reading materials close at hand. 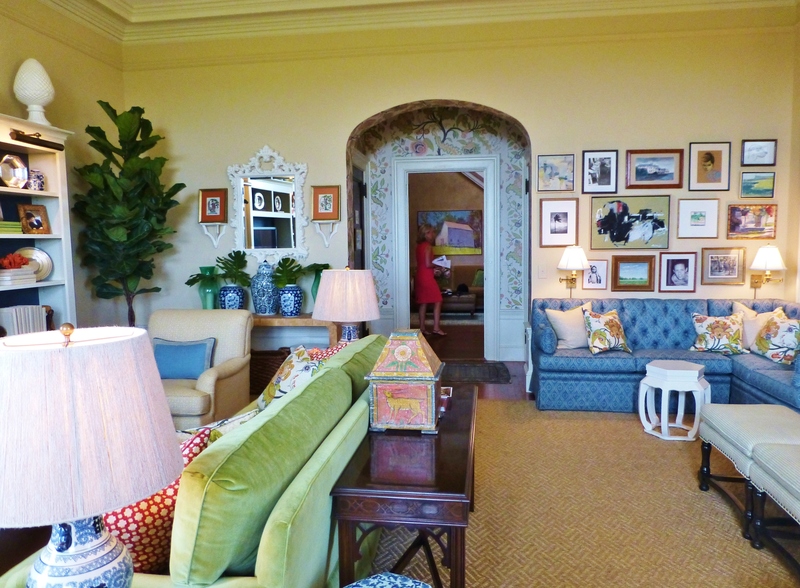 The entry alcove has wallpaper in the same pattern as the colorful pillows used throughout the room. The designer did a great job of zoning the sitting areas in this space, with the main TV viewing area on the left and a custom banquette for lounging near the fireplace at the right. 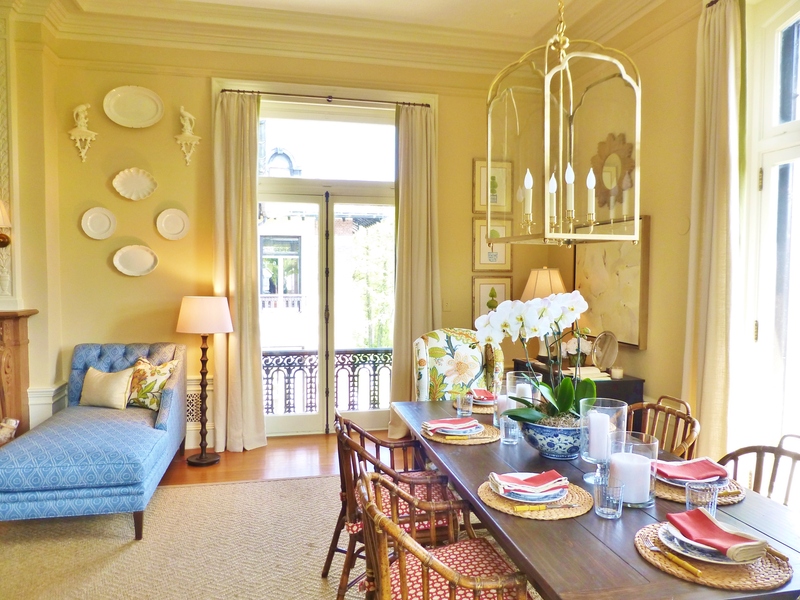 Opposite the entrance, the designer placed an ample dining area near the windows. The same vibrant floral fabric is used once again on wingback captain’s chairs flanking the casual table. 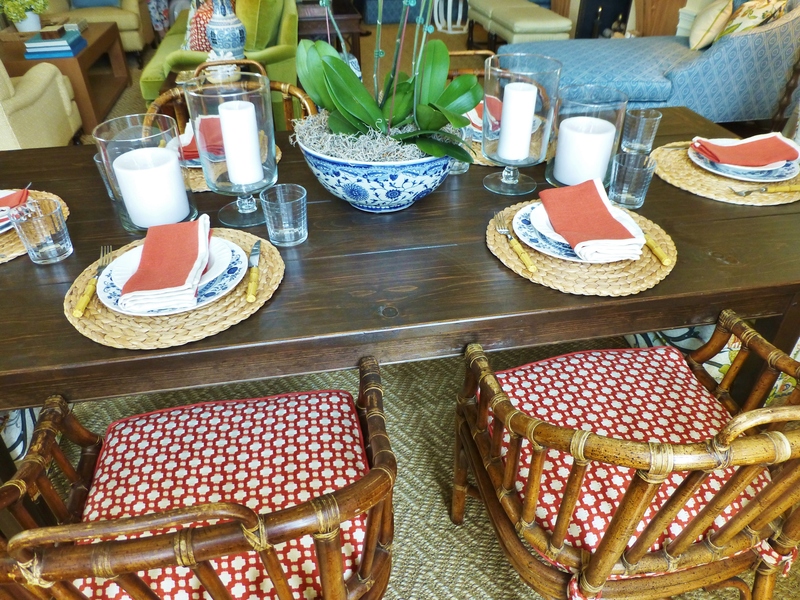 A set of vintage rattan chairs adds texture and warmth for the remaining seating. Here you can see the transition between the sitting area and the dining area. Don’t you just love how the creamware plates pop off the neutral wall color? A large lantern is used as a chandelier above the planked farm-style table. There are just a few more things to which I’d like to draw your attention before leaving this ‘Grey Gardens Great Room’. The entertainment area is home to a lovely custom built-in media cabinet. 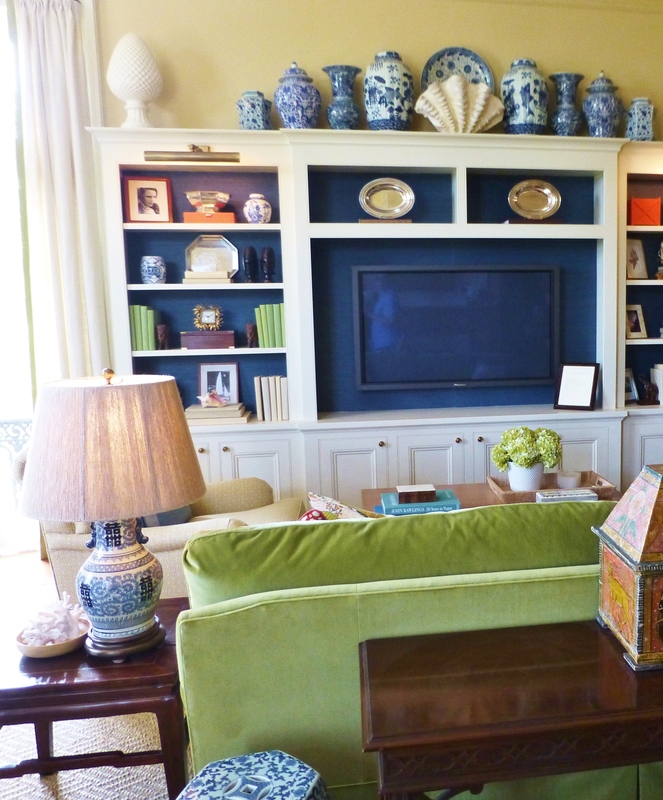 The custom cabinetry houses a large flat-screen television and beautiful accessories. I just love the collection of blue and white porcelains at the top of the cabinetry! The blue and white theme is repeated throughout the room in the lamps and accents. 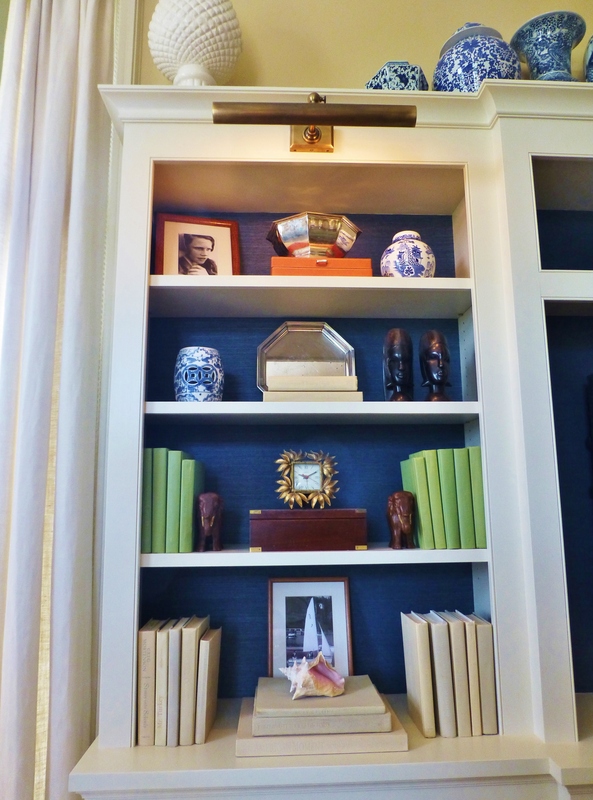 A detail of the cabinetry shows the artful arrangement of cherished objects. The color-coordinated books are fabulous and the bold blue textured paper (grasscloth or possibly fabric?) looks terrific when placed in the back of the shelves. Don’t miss the beautiful library lights at the top of the shelves…I’m currently in the process of installing similar fixtures in my own home library! The rustic table is home to beautiful place settings. Braided fiber mats repeat the natural feel of the sisal floor-covering, while elegant blue and white plates are the obvious choice for dinnerware. Bamboo flatware and vintage rattan chairs also reflect the earthy casual feel of this room. 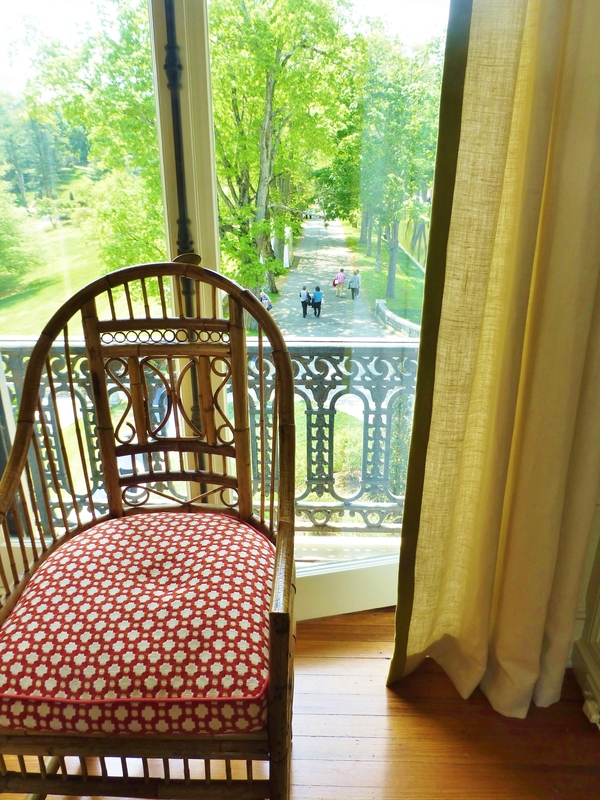 The windows overlook the beautiful grounds at Blairsden. Full-length draperies are fashioned from a simple linen with narrow green banding at the leading edges. 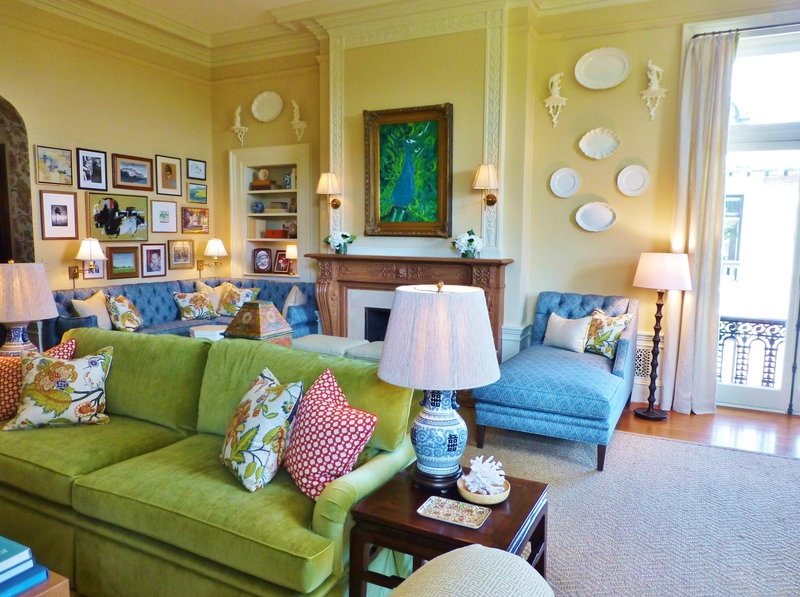 So, what did you think of the ‘Grey Gardens Great Room’ at Blairsden, the Mansion in May? Did you love its colorful understated elegance as much as I did? And what about ‘Grey Gardens’ the documentaries…were you familiar with the eccentric story of the Beals? Please take the time to leave me a comment, I love to hear from you! Until next time, tell everyone you know about Kristine Robinson’s Blog–I need all the friends I can get! This entry was posted in Designer House, Fabrics, Grey Gardens, Home Decor, Interior Design & Decorating and tagged accessories, artwork, Blue, Color, Decor, Dining, Fabric, Furniture, Great Room, Home, Interior Decorating, Mansion in May, Robinson interiors. Bookmark the permalink. Love this space! The great mix and match of patterns and accent give the space a fun flair, but also gives the room a sense of history! Thanks for commenting, Barbara. 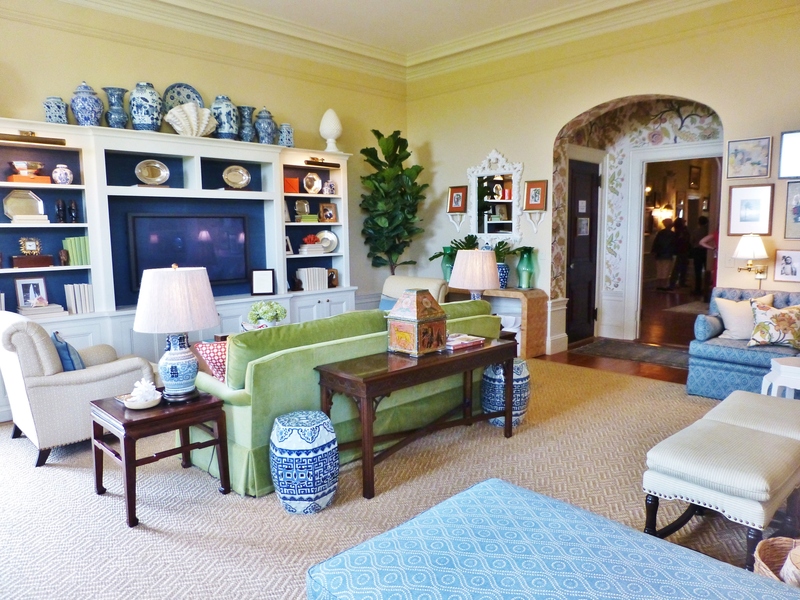 This room was terrific in person….my pics hardly do it justice!